Mangaluru, August 30, 2016: It is shocking to know that the state government has ordered the closure of 3000 schools from this academic year. This is the highest number of schools being shut down in the history of independent India. Most of these are Kannada medium schools. Though the Education Department claims that it has picked only schools with less than 10 children for a ‘merger’ exercise, the reality is that schools are being closed down. Continuing its policy of closing down government schools with less than 10 students on their rolls, the Department of Public Instructions (DPI) has ordered merger of 2,168 government schools in 27 education districts with schools located within 1-km radius. The students could also be admitted in other government, aided or even unaided schools under the Right To Education (RTE) quota. The department claims that in case the local authorities are not able to find schools in 1-km radius, they must make arrangements to ferry these children to other schools in the nearby area. Justifying the move to merge schools, a senior official in the department said it is a logical way of pooling existing resources and to improve quality of schools when there is shortage of teachers. It is disappointing and shocking that no one is giving serious thought to why the strength of children is declining in public schools and what needs to be done to attract them towards government schools. By any accepted criteria, Dakshina Kannada (DK) and Udupi districts lead in the education sector in Karnataka. Every year when SSLC and PUC results are announced the two districts are usually ranked as top performers in the state. When someone is looking for joining professional courses like Engineering, Medical, Law, etc again it is our two districts which are the top choice. Even for primary and secondary education, for those who can afford to pay, we have some of the best educational institutions. However for the poor who want to send their children to elementary and secondary schools, choice is limited. In fact in many villages it is non-existent despite having government schools within two KMs of any residence as per government rules. This is because our government schools and colleges once the only alternatives at the time of Independence have become the last choice even for the poor. An example of Bantwal Taluk would drive this point clearly. In 2006 there were 198 government schools for standards grade first to grade VII with a total student strength of 30,390. In 2016, the number of such schools has declined by only three and there are 195 schools. This may convey the idea, that nothing is wrong with the schools. However if one looks at the total number of students, it should shock every one. There are just 17,758 students which is a decline of 42%. Another interesting but shocking statistics is that 40% of the schools have less than 60 children and also they do not have adequate number of teachers. As a result in some schools, single teacher has to teach two or three classes. In some cases just one teacher has to take all the classes, handle the administrative work besides looking after the mid-day meals and other chores. There are some schools with less than 10 children with one teacher who may be absent or burdened with work other than teaching. Is any one concerned to improve these schools? An example of Sullia Taluk is telling. in June, 2016 the Panchayat had discussion with the Block Education Officer about the fate of five schools whose strength was less than 10. What happened during the meeting clearly shows the indifference of our political system. Some bureaucrat sitting in Bengaluru has decided that it is not possible to keep open schools with less than 10. He sends a circular that all such schools should be closed. When one looks at cold numbers without looking at the future of children, it may make economic sense. However the same official does not bother to give directions to the concerned officials to find out why the school reached such a critical stage of closing, who was responsible for the decline, if children are transferred to a nearby school, what is the condition of such a school, will the children get the right kind of education etc. They are more concerned about what to do with the teachers and how to take care of them and not children whose future is at stake. As mentioned above there was a circular to close down schools with less than 10 students before the change in education Minister recently. In DK district Sullia had 7, Bantwal 6, Mangalore South 3, Mangalore North 3, Belathangady 3, and Moodbidri 3 for a total of 25. 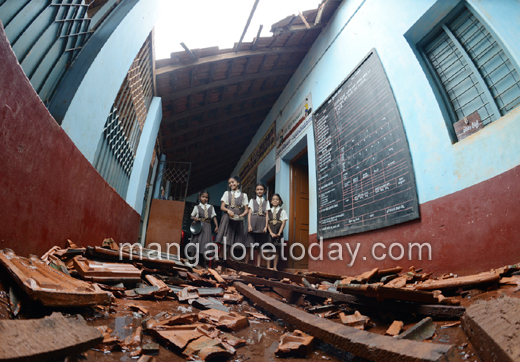 In Udupi district there were also 25 such schools. However when Tanvir Sait took over the education ministry in charge of elementary and secondary schools, one of the first decisions he took was to announce that no schools will be closed. However he continued to support the rule of one teacher for such schools. Still in Sullia two schools one in Aletti village and the other in kollamogra village were closed down in July of this year when there were zero students. Minister’s grand stand of not closing any school should be questioned. Such a populist policy of pleasing some section of the society may not be in the interest of the students. If a teacher is unusually talented and motivated, single teacher schools with students studying from first to seventh grade can be justified. However when most of our teachers are neither talented nor motivated, such single teacher schools are doomed to failure with children learning very little. Still for whose benefit is the education minister supporting the idea of not closing schools? Will our minister send his children to such a school with less than 10 or for that matter even as many as 100? Closing down of a 90 year old school, “Hindu Higher Primary School” in Nagori again shows what is wrong with our education system and also society. This school located in beautiful green surroundings with 16 teachers at one time and over 150 students in 2006 had to be closed down when parents pulled their children in 2011. Despite several requests, authorities failed to take timely steps to improve the educational standards. There are hundreds of such schools in DK and Udupi. Neither the residents or the officials are interested to take up the challenge like Anchan brothers in Dhaddalakaadu near Bantwal town (see the box in next page). During 2011-12, there were 1941 (lower primary, upper primary, and secondary) schools in DK. Out of which 73% or 1422 were government and aided schools which have Kannada medium. In the case of Udupi, out of total number of schools of 1245, 81% were government and aided schools. If one goes only by these statistics, one can feel comfortable that our future generation will be Kannada literate and should be able to promote our rich culture of Tulunadu. However the fact cannot be far from the truth. When parents have the choice and manage to pay the exorbitant fees of the so called convent schools where the medium of instruction is English, they take out their children from the government schools. This is the phenomenon observed not just in DK and Udupi, but all over India. Pratham a leading NGO has been conducting an annual survey called Annual Status of Education Report (ASER) since 2005 till 2014. ASER has revealed that at the national level, percentage of children enrolled in Private schools has gone up from 18.7% in 2006 to 30.8% in 2014 in rural India. It is likely to be even worse in urban India. It is Lord Macaulay who started this whole process of “educating” Indians to provide clerks for East India Company. He would be congratulating himself from his grave how he has successfully Anglicized Indian society. Why are we as a society not concerned at such rapid decline in students in government schools? As per ASER, private school enrollment in rural Karnataka is 25.5% in 2014, percentage of children in grade V who can read at grade II level is only 45.2% and those who can do at least subtraction is 53.7%. If you are one of the parents who send your children to these schools how will you feel if you find out that your children cannot read or do simple maths problems? Chances of such failures are even more in the case of government schools. Not that second tier private schools are any different. Only difference is that their medium of instruction is English. In 2014 in Karnataka, percentage of children in grade V who can read grade II texts is only 45.7% in government schools while it is slightly higher at 53.5% in private schools. This goes to show that private schools where the children of poor parents go are not all that better. Still poor prefer to send their children to English medium schools with the mistaken notion that they are learning better in the private schools than in the government schools. Also it has become a prestige issue even among the poor that their children are learning English in a private school. 92% of schools in Karnataka have library. Unfortunately survey does not reveal how the library is used by the students. 94% have functioning School management committees. But the survey does not show how efficient they are. This result is based on whether the SDMC members can recall when the last meeting took place. 81% of schools have drinking water facilities. 55% of schools have usable toilets for girls. Can any one be happy about this dismal statistics? Every elite private school will have separate toilets for girls and boys. 72% of schools have playground. What I have discussed above concerning the government schools closing down will not come as a surprise to any one who has been reading daily news papers or magazines (see Box-2). What should surprise is that we may see the end of government schools sooner than we expect. That in turn will lead to our future generation being able to enjoy kannada literature and contribute to promote it will also come to a sad end. This should disturb every Kannadiga. Who is responsible for the decline of Govt. Schools? When Right to Education (RTE) was adapted, I was optimistic that it would give access to poor to get admission into some of the leading private schools. According to RTE, every private school should admit at least 25% poor children and their fees will be reimbursed by the government. At that time I did not realize how it will hasten the process of closing down of the government schools if RTE becomes really operational. I looked only at the poor being able to get admission into better run private schools. Unfortunately many of these private schools have managed to skirt the requirement of admitting poor by claiming minority status. Some have also opened exclusive classes for the poor and kept them away from the fee paying students and made them feel inferior. In short one of the goals of RTE to promote inclusive development has been negated. For poorly managed second tier private schools, RTE has become a boon since government is diverting students from its schools to them and adding to their revenues. The very politicians who from every platform shout loudly about the need to promote government schools and Kannada literature, are often the ones who are involved in running English medium schools and professional colleges. They send their children only to choicest English medium schools. More wealthy politicians send their children to foreign schools not for higher education, but for high school education. It is rare to find any teacher of government schools sending their children to government schools. Looking at the pathetic conditions of the government schools, in August 2015, UP high court has directed the chief secretary to ensure all those working for governments admit their children in government primary schools. It is high time we start questioning the concept of neighborhood schools. If they do not have the critical mass of students, it is not possible to have full strength of teachers and all the facilities like laboratories, libraries, playground, etc which are required of a reasonably functioning schools. Multi-grade class rooms which we often see in government schools are not in a position to teach students properly. Government should also realize that while we should promote Kannada (no one questions it), there is also a need to teach our children English. I had studied in Kannada medium school in Bantwal and I had a difficult time when I joined IIT Chennai. Thus I can easily appreciate the problems faced by children from Kannada medium schools when they go for higher studies. Children at young age can easily learn not two, even three languages and be proficient. In DK and Udupi, most know at least two or three languages (Kannada, English, Mapli, Tulu, and Konkani) without any difficulty. When government is capable of founding and operating such world class schools like Demonstration Multi-purpose schools, Kendriya Vidyalayas, Morarji Desai Residential Schools, etc, why cannot Karnataka adapt that strategy to convert all the government schools to such a high standard. If such a strategy is adapted, no one will protest the closing of small schools. If the government starts bringing about such a radical reforms of converting schools to match the standards of Kendriya Vidyalayas, then students will stop going to the so called Convent schools. However to accomplish such a miracle which is not impossible, we need a mini revolution. Our government has plenty of funds for populist schemes like providing cycles for girls, subsidy for every conceivable reason like giving free electricity, welfare schemes like Anna Bhagya, ksheera bhagya, krishi bhagya, vasati bhagya, shadi bhagya, etc. We all know that teaching a person to fish is far better than giving him a fish. Still why have we failed even after 69 years of Independence to provide education to the poor millions? If we are keen on providing high quality education to the poor, then we have to start dismantling reservation policy in education sector. How can a teacher who knows little English if hired to meet the requirement of reservation can teach English? Will SC or ST or OBC students benefit from such a reservation policy when they need the best qualified teachers to help them learn English. But our political class irrespective of any party blindly supports reservation policy even in such sector like education which requires the most qualified people. Today Finland ranks the highest in education sector. This is because there only the best are selected to be teachers. They are paid attractive high salaries. In Finland teaching profession commands the highest respect as was the case in ancient India. Today in India teachers command little or no respect. Still those few teachers who are dedicated and take interest in their students command respect even in India. But how many of our teachers meet such high standards? While government schools have failed because of government indifference, private schools are driven by commercial interest to earn maximum returns on their investment. As a result our children are failing to get world class education. This is not obvious when we look at marks scored by our students. For those who are in the top 10%, scoring above 90 and often 100% even in languages have become an easy task. Do these scores really reflect that they excel in those subjects? Or do they even show that they have critical thinking capacity? Less said the better above our school system inculcating proper value system in our children irrespective of government or private schools. What we need in our two districts is thousand mutinies to bring about radical reform of our failed education sector. The present situation is the reflection of the deep seated prejudices entrenched in the so called upper strata since millennia. The poor and the disadvantaged class have suffered marginalization as a consequence of these inequalities and disparities in every society . Despite that a society, a community, a state, a nation has to rise above all these man- made fissures and aspire to be just, humane, fair and equitable for each and every citizen. What should leading private educational institutions should do? It is high time that the managements of leading private educational institutions (Manipal, Nitte, SDM, Aloysius, Yenepoya, Alva, etc) of DK and Udupi form a high level committee to discuss and suggest a ten year plan to save government schools from extinction. They should take this challenge as part of their social responsibility. Mangalore University can act as a catalyst. RTE has not been able to remedy the maladies of education sector as envisaged. We in DK and Udupi were the first districts to develop the idea of starting private professional colleges. Thus we started a revolution in providing opportunities for many middle and rich class to become doctors and engineers irrespective of their castes. We should do the same to poor section of the society to get world class liberal education. If we fail, then our chances of producing future literary giants like Shivaram Karanth, Panje Mangesh Rao, Manjeswar Govind Pai, etc will be considerably reduced. How soon will Kannada Schools disappear? When I was going to school in Bantwal from 1949 to 1959, there were just three Schools and all had Kannada medium. One was government school, called Board School with a student strength of over 300. The other two were aided schools under the management of Sri Venkatramana Temple. One was Lower Primary from Grade I to Grade V and the other was High School from Grade VI to X. Total strength of these two schools was around 800. There were no LKGs or UKGs. Not even the rich families of Bantwal considered sending their children to English medium schools. Only Aloysius High School in Mangalore was offering English medium at that time. Today in Bantwal town there are four schools and only one is offering Kannada Medium. While three English medium schools offer state syllabus, one is offering CBSE. The smallest school, SVS School with Kannada medium which was started in 1892 has just less than 450. In the same campus the SVS Temple school offering English medium school has LKG and UKG classes with a strength of over 200. Do we need any further proof for our preference for teaching English to our children? This year, SVS Kannada Medium school has just 10 admissions in their first grade. Only forty years back the same school used to admit more than 80 children to their first grade. It does not require much imagination to predict the disappearance of this much beloved school of Bantwal in the next ten years. This was the school where I had studied. Just five years back, old alumni had raised money to construct a brand new building with library, computer room and laboratory. This school does not lack any infrastructure. I had taken special interest to build a beautiful looking five-star quality toilet for boys and girls. Today it is in total ruins. A study into the decline and possible disappearance of my beloved school gives some idea of why the government schools are closing down. When parents are interested in teaching English to their children the temple school management instead of introducing English right from the first grade, started their own English medium school even without getting proper permission from the government. Since they could collect fees from the parents, the management paid greater attention to English medium school and ignored Kannada Medium elementary school. Finally they transferred Kannada medium classes from Grade 1 to Grade V to the High School building and converted Kannada medium into English Medium. Thus the lower primary school was unceremoniously closed down and not one tear was shed. Temple school management concerned mostly with their English medium school did not pay adequate attention to their Kannada medium where student strength was slowly declining. Since Kannada medium school is an aided one, teachers are appointed based on government rules. These rules do not give importance to the educational and teaching qualifications of teachers. The management unlike in unaided school, have no authority or interest to get the best qualified teachers. Despite far better salaries, and frequent training to upgrade their teaching capacity, teachers in government schools do not perform well. They are not held accountable unlike in private school. Of course there are always rare exceptions. The most damaging factor is the appointment of the principal. When I was a student in this school, management had the right to select the most qualified person as head of the institute. In today’s environment of mindless government mandated rules, the senior most teacher irrespective of his or her managerial abilities is made the head. I call this as donkey years rule. Rationale for this simple. Since judging one’s managerial ability is always subjective while quantifying “donkey years” of experience is more objective. in corruption ridden society easy way out is to use objective criteria though faulty and unscientific over an objective criteria. This is one of the major factors for the decline of government schools. Private schools are comparatively better when they appoint competent principal and hold the teachers accountable. Both these factors are missing in the government and aided schools. I had an opportunity to spend some time in a higher primary government school in Dhaddalakaadu, near Bantwal Taluk situated in semi-rural area near Bantwal Town recently. This government school had just 30 students in August 2015. When Prakash Anchan learnt about the possible closure of this school, along with his two brothers and friends took over the management of the school from the government. His NGO known as Sri Durga Friends Club has adapted the school from the Govt. for a period of five years. Anchan brothers took out their children from the private English medium school and got them enrolled in Dhaddalakaadu school to demonstrate their sincerity to improve the school. As a result of this critical step strength of the school went up to 56. This academic year there are 218 students from LKG to Class 8th with full strength of 13 teachers. Three teachers are appointed by the government and ten are appointed by the Durga Club and their salaries are paid by Anchan brothers. What is amazing is the background of these three brothers. The eldest, Purushottam Anchan has completed PUC and is an artist. The middle brother, Prakash Anchan who is the driving force behind the school development has completed just 7th grade and the youngest, Suresh Anchan 3rd grade. Anchan family being very poor, their parents could not send all of them to school. Since the eldest brother was a rank student, younger brothers decided that they would work and send him to college. Two brothers worked in hotels and when they had accumulated some capital returned to Bantwal. They opened a small textile store which became a roaring success. Their marketing strategy was to sell lower end products with a large market at reasonable prices. Now they have three different stores in Bantwal. When they became successful in business, they looked for opportunity to serve the society in the field of education. They used to look for government schools needing some repair work to improve infrastructure. When they were building compound walls of schools in Amtadi and Rayee, they learnt about Dhaddalakaadu and decided to take the challenge to develop it. Though they are not highly “educated” in terms of being conversant in English or having paper degrees or having read books, they qualify to be conferred Ph.D for their concern for society, urgency of improving educational standards, strategies to attract students etc. They are optimistic that in three or four years their school will attract more than 500 students from nearby villages. Presently they are providing free uniforms and transportation to all the poor children. One of their basic principles is to keep the politicians as far as possible and they have not sought the help of any politician. One fact that I learnt from Anchan brothers has amazed me. It was that despite their wealth today, their mother has never left her task of beedi making which she was forced to take up to support her children when they were young. Can any one be more humble to remind of her roots? Anchan brothers instinctively felt that while imparting education in Kannada is absolutely required, it is also necessary to learn English in this era of globalization. From their experience they knew the necessity to learn English. 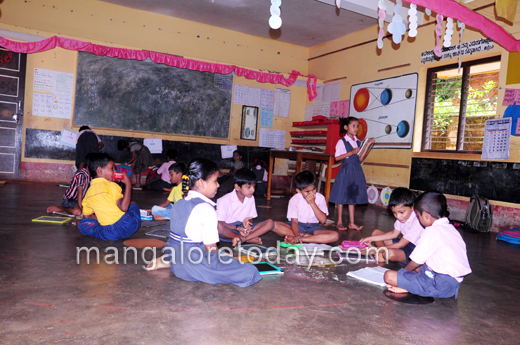 They decided to teach English and Kannada from LKG to children in this school. They did not wait for the government to provide them with adequate number of teachers which would have taken years. They decided to hire themselves. Though they cannot afford to pay salaries at government scale, they pay reasonably high salaries by the private school standards. They know that if they pay peanut salaries, they get only teachers of monkey calibre which many managements have yet to realize. Durga Club has taken another challenging task of constructing additional 13 class rooms for a cost of one crore rupees. Anchan brothers are optimistic that the society will come to their help as a result of their dedication and the significant contribution of the family. It will not be an exaggeration to state that Anchan brothers have created a miracle by reviving Dhaddalakaadu, a failing government Kannada medium school which was on the verge of closure. They have a dream of promoting a state wide movement to save government schools in Karnataka. If they continue at the current rate of progress they may pull that miracle with the help of like minded people. In a path breaking decision, UP High Court has directed the Chief Secretary to ensure that children of government officials/servants, those serving in the local bodies, representatives of people and judiciary, etc send their wards to government primary schools. The judgement resulted after the court examined the pathetic conditions of the government schools in August, 2015. The court observed that only when their children attend these schools, then only they will be concerned and serious enough to look into the requirements of these schools. It should not come as a surprise that Karnataka Unaided Schools Management Association (KUSMA) criticized the judgment as deeply flawed. KUSMA argued that it is the fundamental right of every citizen to which school one would like to go and no authority (Judge, Legislature or Parliament) can take away the right. Does KUSMA worry about the constitutional requirement of providing free and quality primary education to every student? Will any public spirited person file a PIL in Karnataka High Court urging for a similar order to save the disappearance of the government Schools in our state? Unfortunately a web search to look for the implementation of this progressive judgment did not show any results. The judgment was supposed to have been implemented in six months. Either the judgment has not been implemented in UP or the media has lost interest in this topic to follow up. Dr. Bhamy V. Shenoy has been a senior advisor to Center For Energy Economics, at UT, Austin and a board member and was an advisor of the National Oil Company of Georgia. Dr. Shenoy is an Advisor to Pratham Mysore an NGO involved in slum education and Board member of SVS College, Bantwal.